Lauren Keeley, installation view of Parallax scrolling, Breese Little, London, 2017. On the occasion of the opening of the group show, Parallax scrolling, at Breese Little in London on 26th January 2017, Marcelle Joseph interviews the British artist Lauren Keeley. Her work is featured in this exhibition alongside that of fellow British artists Nicholas Hatfull and Jackson Sprague. Keeley’s practice encompasses many processes of image-making including painting, photography, printmaking, digital design and rendering software, melding the hand-crafted with the digital age to create intricate, meticulously designed artworks of unadulterated beauty and reflection. When I think of your work, the first word that springs to mind is “motif”. Your blend of cropped figure, pattern, objet d’art, furniture, interior architectural details and exterior landscape is curious as there does not appear to be any hierarchy among these pictorial elements, rendering the figure just another motif in the tableau. How do you think about “motif” in your practice? Motifs are certainly really central to my work, I use them ornamentally, as symbols but also as a theme or idea with which to structure the imagery. So, for example, a frequent motif in my work has been the window which I’ve been drawn to because it acts as an intermediary between an interior and exterior space but is also a metaphor for the image, the framed view. I then like playing with these zones of space, shifting the emphasis between the interior and exterior across works and using cropping to give a sense of incompleteness — that there is more to see beyond the frame. Motifs that are used in these interior and exterior spaces are mostly decorative; there is an element of needing to fill or decorate the pictorial space, whether that be furniture in a room or plants in a garden. For some of the elements, they are included to create textures and detail across the surface of the panels, through using a mixture of inlay, screenprint and coloured fabrics. Then there are often a few elements which have a role of creating points of focus in the image to interrupt the familiar interior/exterior setting. For example, figures and animals are often used to move between spaces, whether this be within the pictorial space or beyond the frame entirely. And then I might include a picture or a mirror to create further pictorial spaces. The picture opens up an extra space and the mirror is reflexive, reflecting the depicted space from beyond the frame. You’re right in saying there appears to be no hierarchy amongst the elements. Whilst some have a stronger part to play in creating moments of focus across the composition, generally it is about creating visual patterns and textures and points of detail, and I may pay more attention to the herringbone brickwork pattern of a floor than I do to a figure. I quite like this because even though the works are very elaborate and filled with various materials and processes, there is also a real flatness, almost an emptiness that sort of nulls everything. Lauren Keeley, Flurry (2015), acrylic, linen and wenge on board, 168 x 126 cm. You describe yourself as a painter and a print maker on your website and your work often sits on the wall but your process is very different from a traditional painter. Could you describe your intricate process of layering laser-cut wood either painted, printed, left in its raw state or covered in linen? Yes, the work is made up of wooden panels which are layered together to create a relief; whilst portraying imagery, they are physically very sculptural, acting as a sort of frieze on the wall. Each panel is a combination of coloured linens, hardwood elements and screenprint. The first stage of the work is digital. I design the imagery in Illustrator editing software, and from this flat illustration, I can decide how the work will be structured, how the various elements will be treated and to work out the palette. From here, I reduce the imagery to simple lines which get laser cut across various thin plywood panels to form the basic jigsaw puzzle of each work. Once I have the laser cutting, the rest of the work is very manual. It’s a case of building the panels so initially there is a lot of woodwork involved, and once the panels are made up, they then are stretched in fabrics. On each panel, there may be a variety of fabrics, sections that are shaped instead of straight edged, hardwood inserts and some elements may have screenprints on them too, so the surface of a panel will be handled in a variety of ways. I do this by inlaying separate parts into the surface, so I can treat the various sections differently which then comes together like a big jigsaw puzzle in the end. Your work explores many periods and styles from neo-classicism to rococo, post-war modern to contemporary style. When I visited your studio, you were in the middle of researching ceramics at the Victoria & Albert Museum. How do you start on a new body of work? Where do you find your period references? The initial motivation for a new body of work often comes from a rather vague place; it might be a small detail from a film, artwork or book, or be something that I’ve seen that sparks an idea. To use the word motif again, there is often a theme or structure I am drawn to that I feel could form the basis for a body of work. From there, I am much more focussed and research histories and narratives I find that connect to the idea. I often visit places that could provide useful visual source material, so for example if I know there is going to be a garden element in the work, I will go and visit interesting gardens, taking lots of photos and looking for any elements I could extract and use. Barbara Hepworth’s garden in St Ives formed the basis for a few previous works; I was really drawn to the connections between the forms found in her garden and those seen in her art. It really is a place where art and nature mix and merge. Once I’m quite sure of an idea I start working on the drawings in Illustrator and do a lot of image collecting. It’s very much like sourcing props for a stage set and normally there’s a to and fro between the drawing and these props. They both inform each other. I generally don’t have a set idea for the drawings before I start them; they are quite intuitive and will change an awful lot before I settle on the final fixed idea. Because the paintings are then entirely based on a composition of laser cut panels, there's little flexibility, so the drawing stage is really important for the final result. There have certainly been instances where a drawing hasn’t been entirely resolved but I’ve gone ahead with a work anyway and had disappointing results. I’ve just had to learn that even though there's not much to physically show in this stage of the work and it can feel a little intangible, it’s a really crucial part of the process which needs to be fully resolved before the work is started physically. Lauren Keeley, Ode on an Urn (Newcomb/Wedgewood) (2016), linen, acrylic, walnut and wenge on board, 32 x 45 cm. 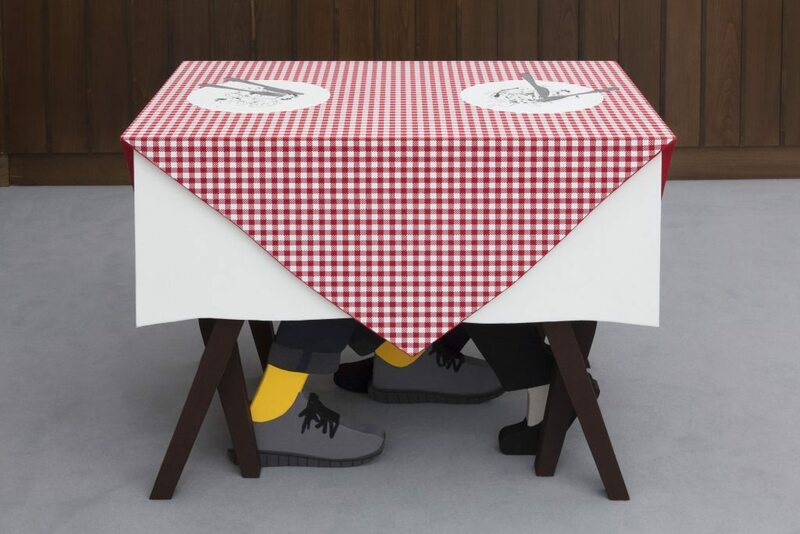 At Frieze London in October 2016, you presented your first pieces of sculpture in the form of these incredibly vibrant and humorous painted tables and chairs reminiscent of those found in a traditional Italian trattoria. Was this a difficult transition or a natural progression from your flattened three-dimensional wall paintings? It did feel like a natural progression and something I’ve been wanting to explore for some time. The group presentation and trattoria theme for the booth became the perfect occasion to try this out. If you imagine with the paintings before they are layered together, they exist as parts so there will just be lots of shapes and sections lying around the studio. It’s almost like this all gets flattened in the final stages of making the works. So there’s always been this ‘what if?’ in terms of venturing into the floor space, because in the studio the works do exist as objects until the last minute. Having said that, I definitely think in a very 2D way and so it did take me a while to understand how I would construct the tables, and I was terrified they wouldn’t balance or be level! But once it made sense, it did feel like an extension of making a painting -- just a little more deconstructed and with a few more angles. Lauren Keeley, Table for two (2016), screenprint on coloured linens, plywood, 73 x 63.5 x 93.4 cm, courtesy of Frutta, Rome. What are you showing at the Breese Little exhibition? And what relationships do you feel your work has with that of Nick and Jackson? I’m showing three large staircase works which are designed to be legible vertically; the imagery moves upwards. I liked the idea of the staircase as a structure used to transition between spaces, with itself becoming a liminal space. In the works, there’s little suggestion of anything beyond, rather that the staircase might just keep escalating. The imagery would be most coherent if the paintings were stacked on top of each other but of course in the gallery space they are presented in a horizontal formation. However, I really like them as a horizontal group, and there was a lot of careful designing so that they would work in this way too, the composition of the two end works are reflections of each other so there’s a sort of symmetry. I like that, when reading the sequence in this formation, your eye has to zig zag across the works, interrupting our inclined left-to-right way of reading images. The show itself has been a really enjoyable and involved experience, and it’s been great to become more familiar with Nick and Jackson’s work. At first, there wasn’t a strict idea as to what the show would be about and how our work formally interrelates, but through meeting as a group and long email exchanges, the crossovers in our work gradually revealed themselves. I think there are connections but also a lot of differences between our practices, which I found made the process more interesting. I feel my work links with Jackson’s in terms of craft and how we make our work, with both of us often working digitally towards getting something fabricated, which then goes back to the studio to become very manual again. I think for both of us there's a lot about the translation between the hand and the machine. With Nick’s work, there’s again a huge interest in the motif; his work is full of signs and symbols, but they are more from the everyday. His work mixes and restructures the symbols we encounter in the commonplace. Rebecca Lewin, who curated the film programme and who also wrote the essay for the show, was brilliant at joining the dots and bringing our three practices together a little more coherently. The show is titled ‘Parallax Scrolling’ which is a technique used to create the impression of distance and space, mostly used in computer graphics. It’s essentially a process that places distance between flat layers so you get an impression of depth, a bit like a stage set, so it’s about creating space in imagery in a very different way from the conventional use of perspective. I think each of us sits on a different point of the spectrum with regards to this idea. The space in Nick’s paintings often feels very compressed; there’s a coherence in the way he collages his imagery but also an abstraction and disjointedness. And Jackson’s sculptures bring this idea into the 3D. I find his large sculpture in the show particularly amazing to look at; from some angles, it really fills space and has a commanding physical presence, and from another aspect, it is very slight like it has morphed or vanished in the space somewhat. My work probably sits somewhere in the middle. Of course, it has a 3D physical aspect, but it is still very flattened with just a small distance between each layer. 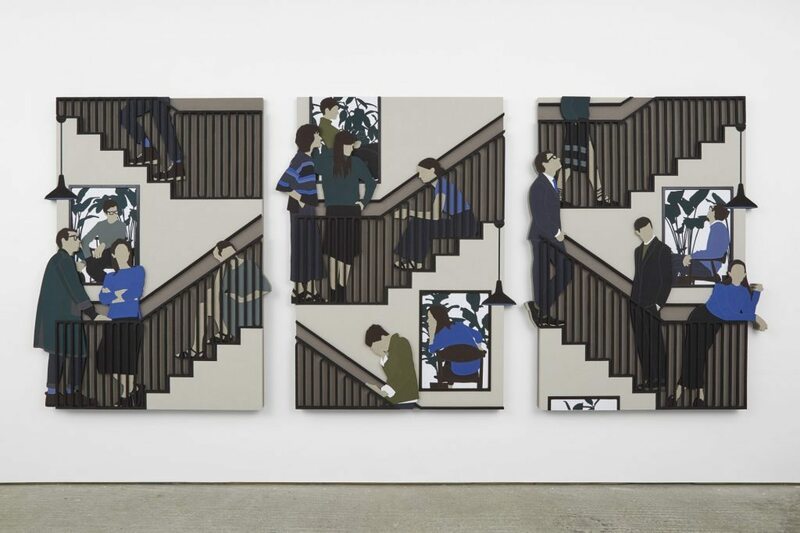 Lauren Keeley, Halfway Down (2017), acrylic, linen and stained walnut on boards, 184 x 127 cm, courtesy of Breese Little, London. Does your thought process change when making work for a group show as opposed to a solo presentation? Yes absolutely. Because I like to play with the framing and cropping in the works, often having elements that start on one piece and lead into the next, the work is suited to a series and so the opportunity of a solo presentation gives me that space. I enjoy having repetitive motifs which are approached in different ways across separate works, and so working across a group allows me to do that. I think too with larger projects, you have time to really think and let ideas develop. I’ve realised that I find it more difficult making one-off works; I think the single frame is too restrictive for me, and I am not able to research and mull over a single image as much as I do when working on a series. Instead, I’ve thought that having my own ongoing studio projects might be a solution to this problem so when you visited my studio, you saw the beginnings of a few paintings based on ceramics. There is no end goal in terms of showing these works, but I really enjoy researching and adding to the series. It feels like there’s an ongoing dialogue there, which is important for me. However, with the Breese Little show, and another group exhibition I was part of last year called GranPalazzo, I’ve been able to make a significant body of work, which has given me that time and space, so I think group shows where I’m able to have a substantial participation are really appealing and more suited to the way I work. 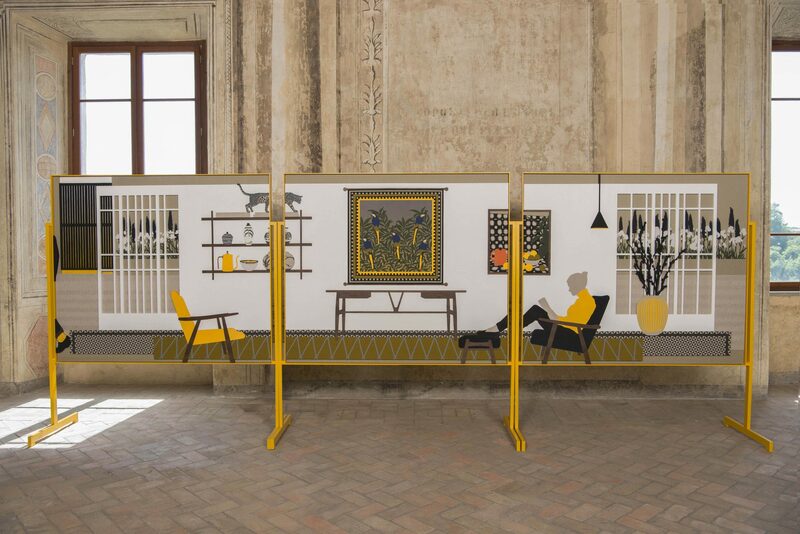 Lauren Keeley, It could have been us, it could have been you and I (2016), installation view of GranPalazzo, Palazzo Rospigliosi, Zagarolo, Rome, courtesy of Frutta, Rome. What’s next for you after the Breese Little show? I’m going to have a solo presentation at LISTE in Basel with Frutta in the summer so that is my focus now and will pretty much fill up my schedule. I’m really looking forward to starting this project and being able to focus on a large body of work again. When we last spoke in your studio in 2016, you spoke about the gentrification of New Cross and how that was going to affect you in terms of having to find another studio and most likely in a less central location. Has Brexit delayed that move? Do you think that government should get involved in some way to prevent the mass exodus of creatives from London due to sky-rocketing rents and gentrification? Brexit is definitely delaying the process; there’s development signs all over the area but it does seem to have stalled. We’ve just had the lease at my studio building extended until the end of the year. Of course, I would like there to be more stable and reliable work-space options for creatives as I think the city is really important for a lot of artists. By its very nature, having a studio practice is very solitary so you need the city to counteract this, to keep connected and uphold a community. I will definitely have to move further out next year, most likely more south. This is OK but I do think when you are a young artist just starting out, having that one studio visit can really change things, and so if you are in an even less accessible area, is someone going to be put off from coming to see your work? It’s fantastic that Sadiq Khan is recognising this as a problem in London and hopefully things will improve, but you also realise there is a general squeeze on the city in terms of housing and resources, and gentrification is a double edged sword. You want to see an area flourish and improve but it’s difficult when there are groups of people that get pushed out as a consequence. Parallax scrolling runs from 27th January – 18th March 2017 at Breese Little, Unit 1, 249 – 253 Cambridge Heath Road, London E2 6JY. Lauren Keeley (born 1986, Milton Keynes) lives and works in London after graduating with an MFA from the Slade School of Fine Art, London (2014) and a BFA from the Ruskin School, University of Oxford (2010). Recent group exhibitions include Frieze Art Fair, London; Slate Projects, London; GRANPALAZZO, Rome (all 2016); and Milton Keynes Gallery, Milton Keynes (2013 and 2011). She has had recent solo exhibitions at Frutta, Rome and Supplement, London (both 2015). Keeley is represented by Frutta, Rome.